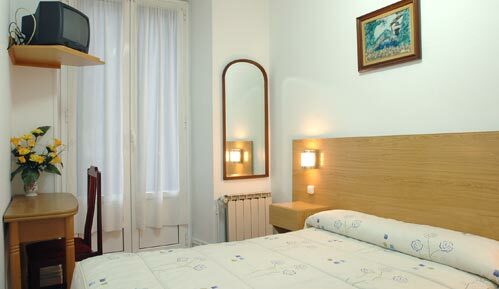 Right in the Heart of Barcelona City Center Ideal Place to stay for Budget Travlers and Backpackers. Enjoy comfortable accommodation in the heart of Barcelona, the Hostal Manu accommodation where you will find simple but yet all you need to make your stay very pleasant. Hostal Manu constructed on a building of the twentieth century is now fully restored and equipped to meet customer needs. Enjoy the exterior sunny rooms, comfortable and bright and our large terrace throughout the year. Free Internet access, laundry service and luggage storage are available to our customers. The reception is open 24 hours on 24. You will also find information about the city. The rooms are neat and clean. The rooms come with exterior and interior windows. The beds which would be given to the people would be with bed sheets. Hand Wash basin is also available in the room with an TV Set with TDT channels. The hostel is situated in the heart of the barcelona at 5 minutes from LAS RAMBLAS, which is an passage starting from PLAZA CATALUÑA till CHRISTOPHER COLUMBUS STATUE. At LAS RAMBLAS you can find restuarants, cafe bars and gift shops. On the LAS RAMBLAS you can come across the WAX MUSUEM OF BARCELONA, MARKET OF ¨LA BOQUERIA¨. Going Further down the LAS RAMBLAS one can come across PLAZA REIAL where all the beer pubs are located. Near to the status of CHRISTOPHER COLUMBUS you can come across the an amusement centre which can got all the shopping brands, restaurants and IMAX cinema house. Hostal is at 8 minutes walk from the BARCELONA CHURCH which is in PLAZA JAUME and which is open for the tourists. Payment would be preferred in advance. The cancellation should be notified 48 hours earlier. HOSTAL MANU is situated in the centre of Barcelona, the most vibrant and cosmopolitan city in Spain. Barcelona, the sunny capital of Catalonia, is famous for its colossal cultural heritage, incredible Architecture, stunning views, white-sand beaches, exquisite cuisine, and bright nightlife. The adress is C / Hospital No. 93. From the Barcelona airport you can take the train till Passeig de gracia and then do an interchange and take green line (L3) till liceu and in front you would find the street C / HOSPITAL. From the Barcelona airport you can take the bus till plaza Catalonia and from there you can take the underground green line (L3) and come out at the train station name is Liceu.